Venus is a hellish place of high temperatures and crushing air pressure. The European Space Agency's Venus Express mission adds into this mix the first confirmation that the Venusian atmosphere generates its own lightning. The discovery is part of the Venus Express science findings that appear in a special section of the Nov. 29 issue of the journal Nature. "In addition to all the pressure and heat, we can confirm there is lightning on Venus -- maybe even more activity than there is here on Earth," said Christopher Russell, a NASA-sponsored scientist on Venus Express from the University of California, Los Angeles, and lead author of one of the Nature papers. "Not a very good place to vacation, that is for sure." The discovery puts Venus in elite planetary company. Scientists currently know of only three other planetary bodies in the entire universe that generate lightning -- Earth, Jupiter and Saturn. Lightning on Venus -- as well as on any other planet -- is an important discovery because the electrical discharges drive the chemistry of an atmosphere by breaking molecules into fragments that can then join with other fragments in unexpected ways. The lightning on Venus is unique from that found on Earth, Jupiter and Saturn in that it is the only lightning known that is not associated with water clouds. 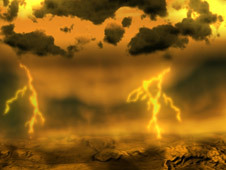 Instead, on Venus, the lightning is associated with clouds of sulfuric acid. Any future missions to the second rock from the sun may have to take into account the electrical activity in the Venusian atmosphere. The confirming measurements of the electrical discharges were made with data obtained by the Venus Express magnetometer instrument provided by the Space Research Institute in Graz, Austria. The measurements were taken once a day for two minutes, during a period when the spacecraft was closest to Venus. A Venusian day is about 117 days long. With its primary mission completed, Venus Express will now embark upon its extended mission to watch Earth's nearest planetary neighbor for two more Venusian days. Among other things, it will look for the telltale infrared radiation from lava flows. In 2010, when a Japanese mission, Venus Climate Orbiter, also called Planet-C, arrives at Venus, scientists will be able to compare results from the two spacecraft.